I opened the latest West Elm catalog and immediately noticed their Gilded Vines Metal Wall Art. 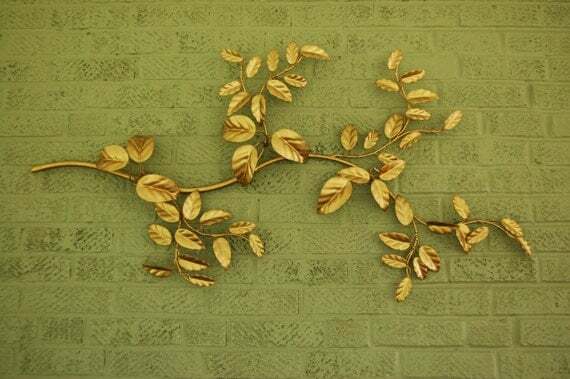 This gold metal vine is available in the Pursuing Vintage Shop. What do you think? Can you “hang” with the gold wall hangings? Yeah, baby… thinking of something like this over my bed. So pretty. You are a style diva, Kristen! I can totally hang and I currently AM! Scored the most amazing brutalist-style gold wall art from the Rose Bowl Flea a few years back and she currently sits in my LA pied-a-terre ;D Love how instantly GLAM the vibe is! Great find! 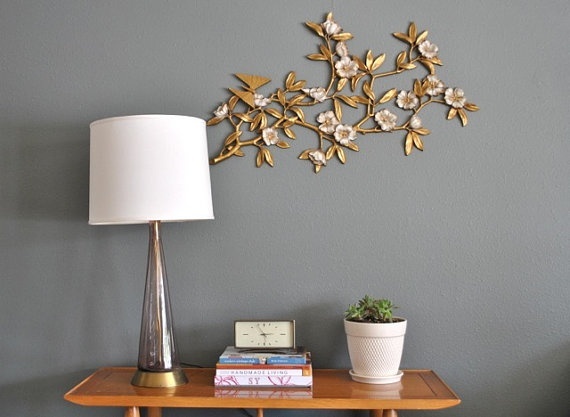 I wouldn’t hang the gold leaves in my house, but I do love the way warm metals play with dark-painted walls. I s’poze this means copper or antique brass light fixtures +/or cabinet hardware at our project fixer-upper. Yum!